Ron Thomson originally from St Andrews, Fife moved to Fort William in the late 1950’s. 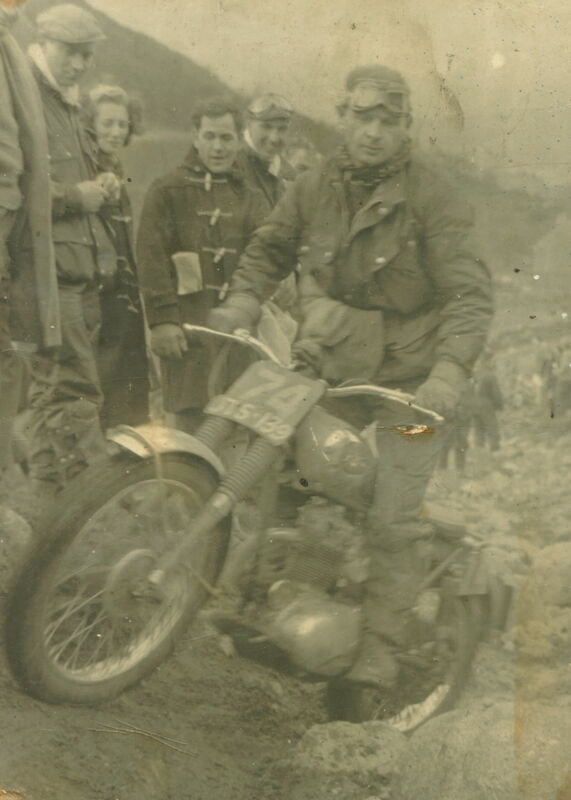 Ron was a dispatch rider during national service in Egypt and a member of the services club, the Bar-None MCC. On being de-mobbed, Ron joined the local Kirkcaldy & District club. Ron takes up the story: “In my day trials bikes were measured by the hundredweight, not by the cubic capacity! I had a Gold Star, which was dubbed the ‘Stone-Crusher’. So called because no section was ever the same after we had gone through. As for the Scottish Six Days, we used to gear the bikes up, my Trophy Triumph was good for 90 plus mph on the road, the reason for the hurry was that we used to be more interested in the ‘Seven Nights’ than the Six Days!” says Ron. Ron on his BSA C15T in the 1959 Scottish on Glenogle section on May 4th. One of the first day hills as he made his way homeward to Fort William from the Edinburgh start. 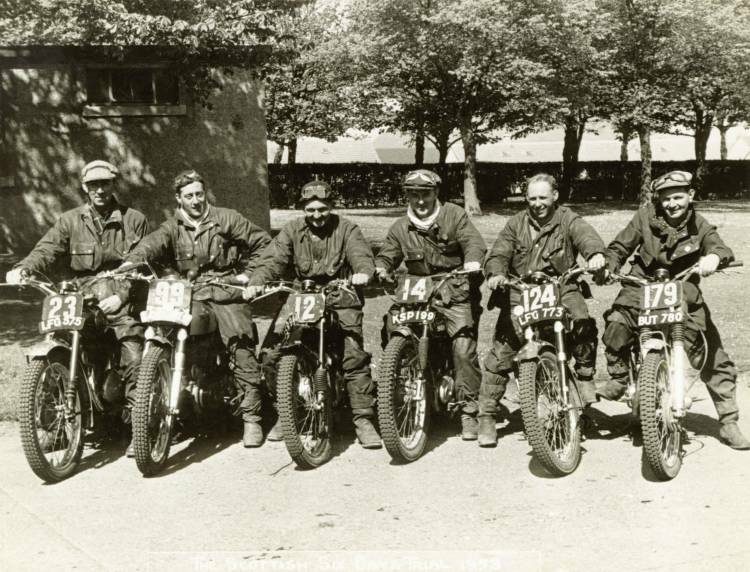 On the second right is Dunfermline rider the late Maurice Duffin. Photo: Mrs. Peggy Davies. 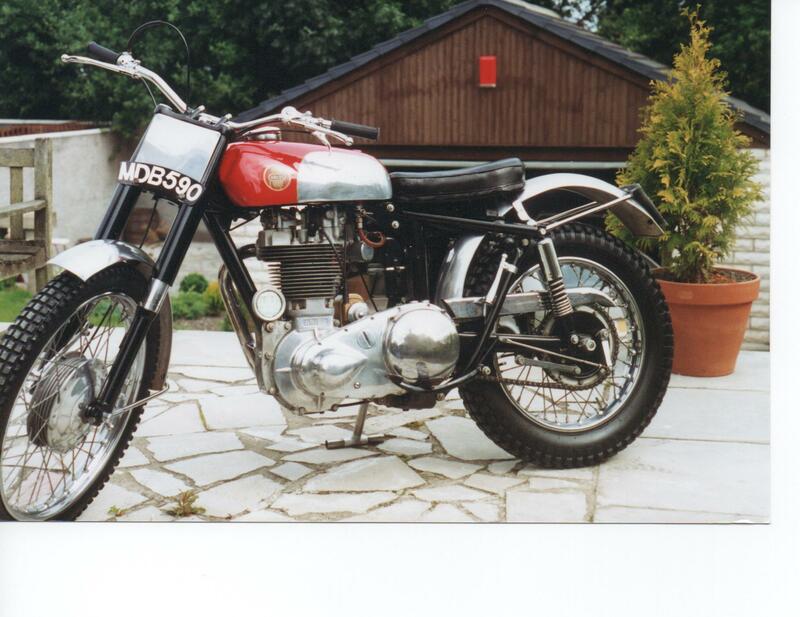 That particular Goldie, as Ron had one or two, registered PFS 916 had a neat conversion, featured in the first 1958 SSDT report in The Motor Cycle. In an attempt to reduce weight, Thomson used the gearbox as an oil reservoir for the motor thus obviating the need for an oil tank. 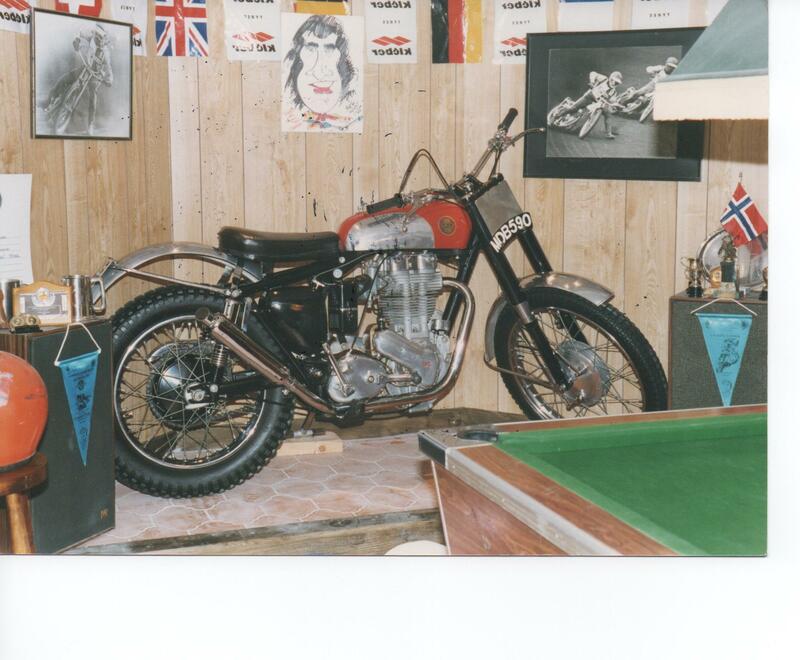 The very machine on which Ron won the over 350 award at the 1969 Scottish which was to be his last ride in the Highland classic. That Gold Star was sold via Ernie Page’s shop in Polwarth Terrace and was passed through many ‘hands’ eventually ending up with Billy Maxwell in Newcastle Upon Tyne. 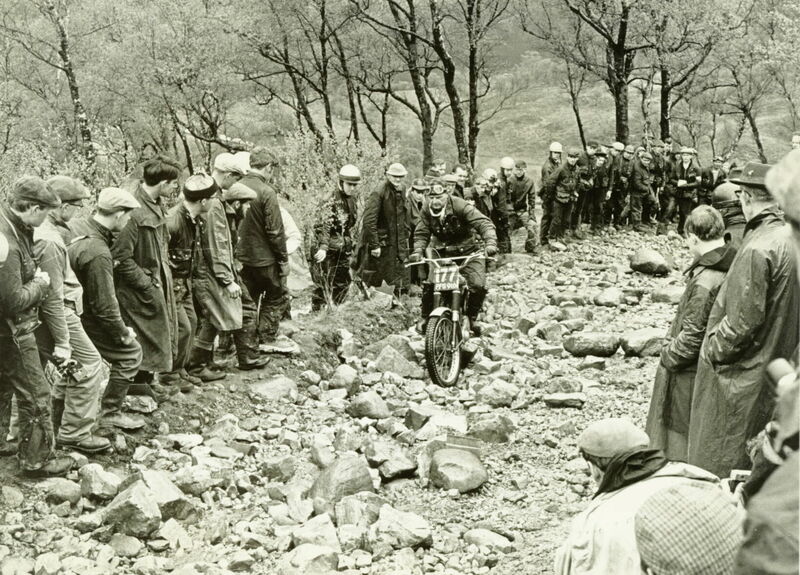 1964 SSDT on Mamore. Ron Thomson on his BSA Gold Star PFS916 – ‘The Stone-Crusher’. Photo courtesy of Mrs Helen Thomson, Fort William. 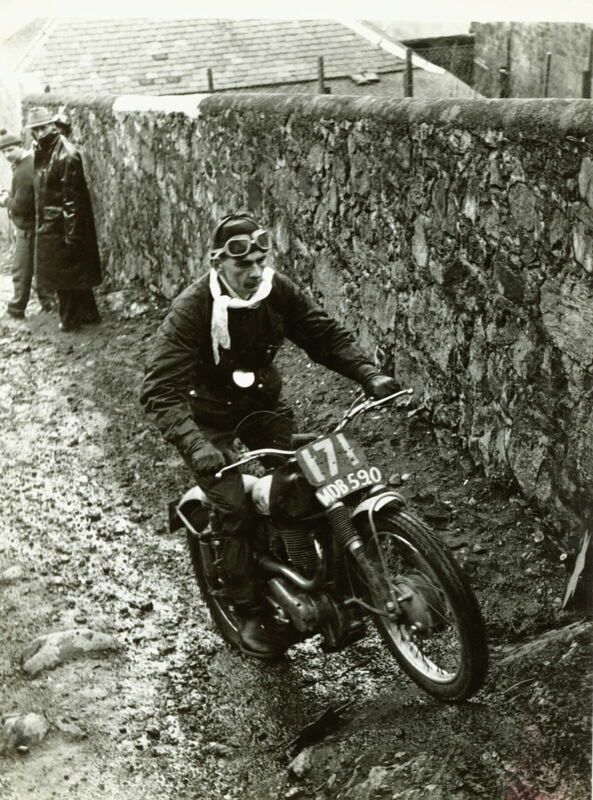 Ron loved riding the Scottish Six Days which was in effect a local event for him as he lived in Inverlochy at that time. Ron said: “…well it was more the seven nights I was most interested in to be truthful, we used to get up to all sorts of fun”. Ron knew an observer called Tommy Millar from Airdrie, a man who never had a complaint registered against him in over 25 years of observing- what was the reason? “I just gie a’ the laddies a clean”, he told Ron. Ron said: “I’ve no doubt that the kids today on their water cooled pogo sticks in their go faster trendy bin liner suits will enjoy themselves just as much as we did, but still I think had greater fun in the golden years”. Ron had a reputation as the man to approach if you wanted your bike fettled for the Scottish. He worked for a spell at the Brechin dealership, Duncan’s. Ron prepares to start his BSA Gold Star at the beginning of the 1963 Scottish in Edinburgh’s Gorgie Market. Photo Courtesy of Jimmy Young, Armadale. At one stage Ron, when still an active rider, prepared about a dozen Lochaber members bikes for the Highland classic. 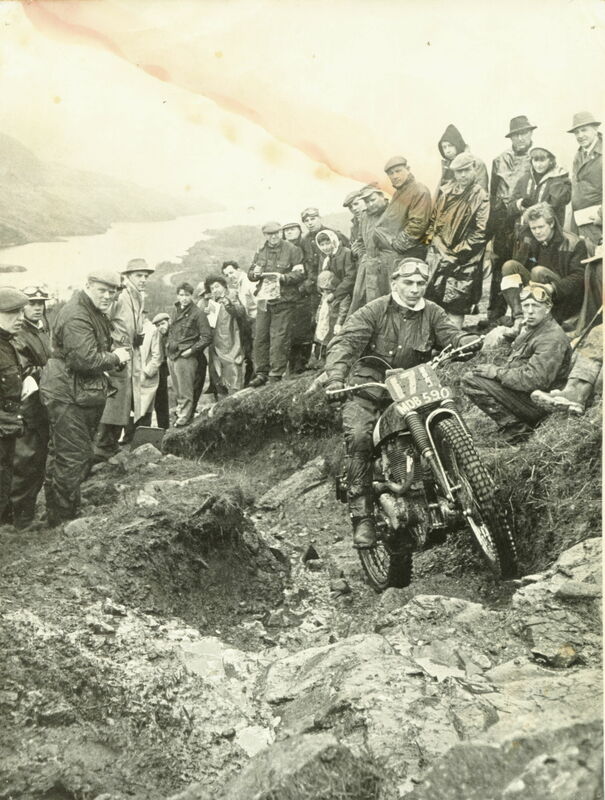 Tyndrum, on the final day of the 1964 SSDT. Photo courtesy of Mrs. Helen Thomson, Fort William. Alister McDonald was a great friend of Ron Thomson. 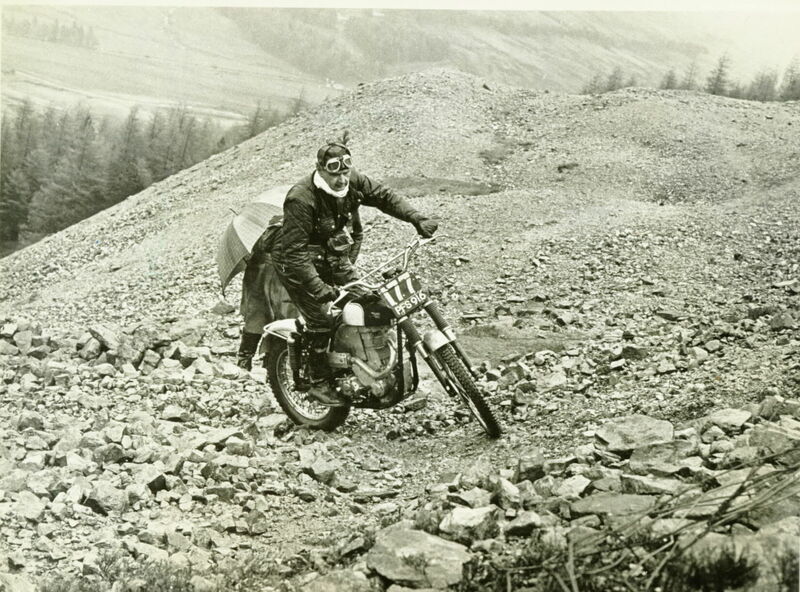 Here we see Ali on his Ariel HT5 on Town Hall Brae (Rocky Brae) in Fort William in the 1964 SSDT. Photo Courtesy of Mrs Helen Thomson, Fort William. Known as a ‘big bike’ man, Ron also rode the “tiddlers” as well. 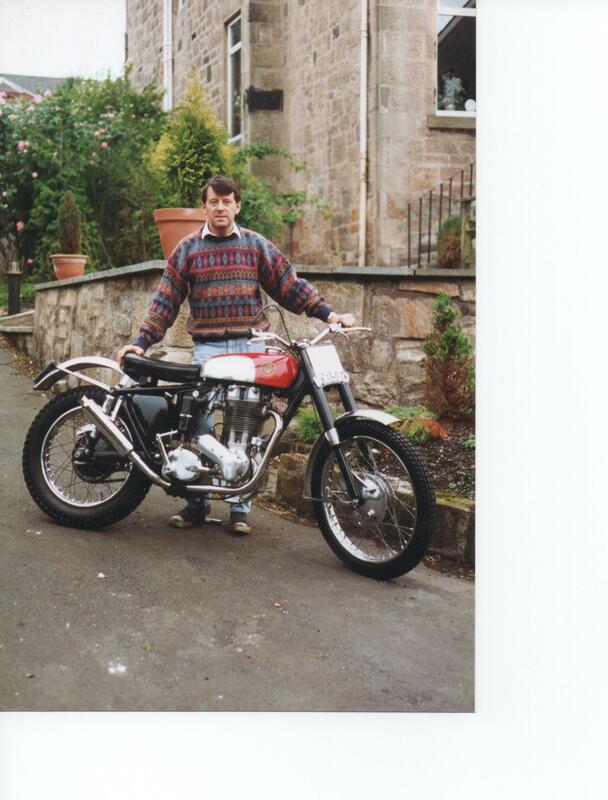 In 1959 he chose the brand new C15T BSA 250cc unit construction single for the Scottish Six Days. In fact, out of eight C15’s entered, Ron was the only one to get to the finish and that included factory bikes as well! 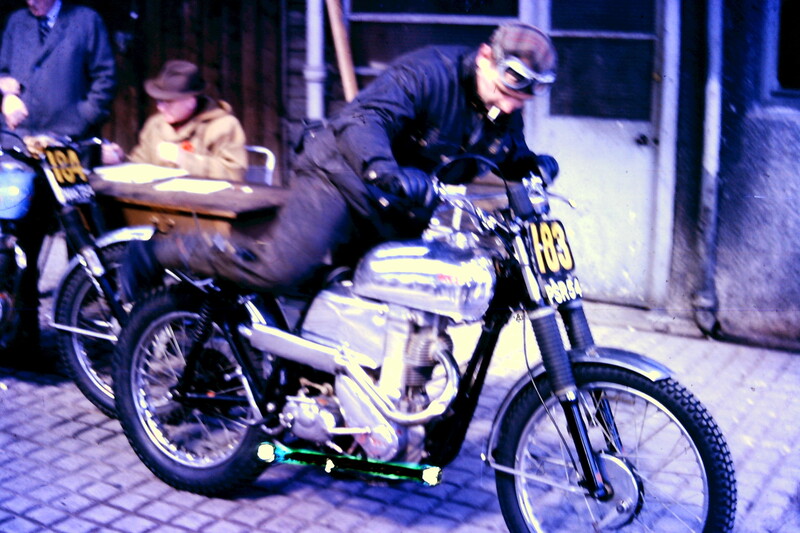 Watched by Jeff Smith in the duffle-coat, Ron Thomson on the only C15T BSA to finish in the 1959 Scottish. All the works bikes had retired from the event. This section was at Achintee farm on the slopes of Ben Nevis Photo courtesy of Mrs. Helen Thomson, Fort William. 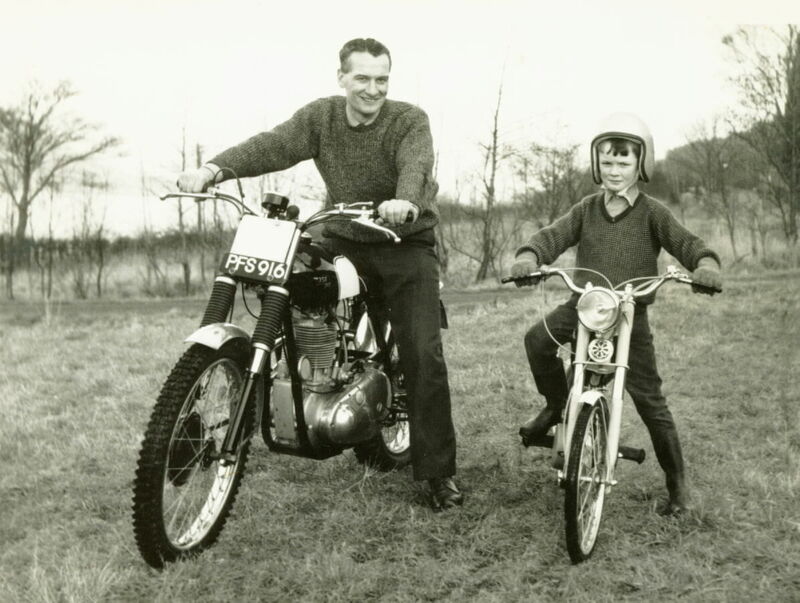 Back in 1955 he rode a Villiers powered 197cc DMW and a year later rode a similarly powered Welsh built 197cc H.J.H. 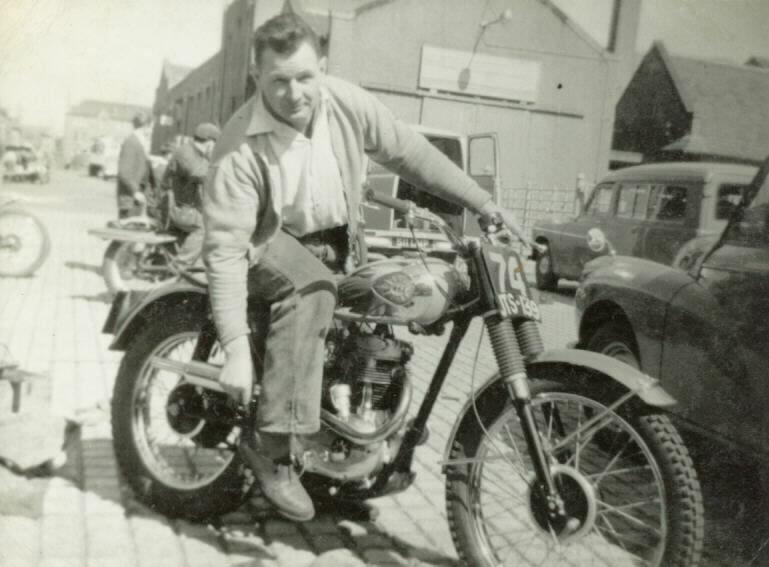 In the 1953 Scottish, Ron rode a self-built ex-WD 343cc Triumph, the following year he rode a 347cc Matchless G3LC. 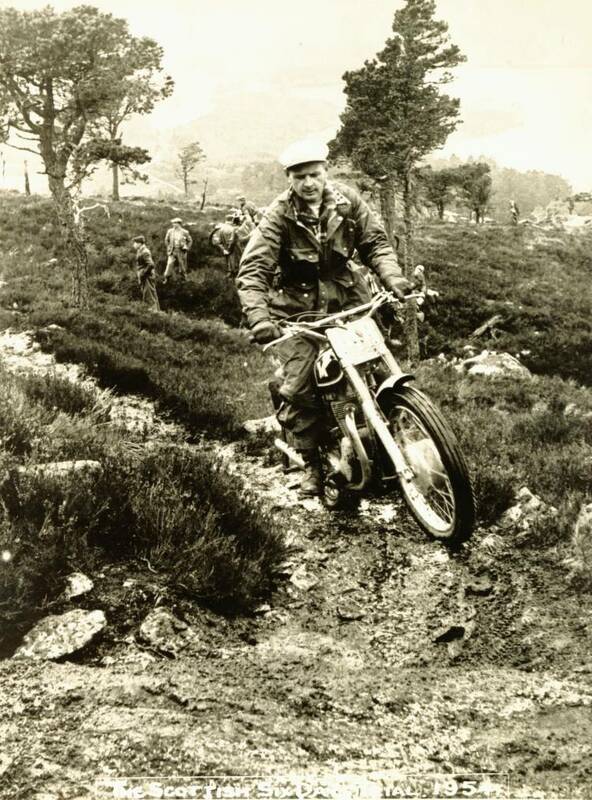 Ron Thomson on his new for that year 347cc Matchless G3LC in the 1954 Scottish on Creag An Eilein on the Rothiemurchus Estate, near Aviemore. Photo: Ray Biddle, Birmingham. Ron S. Thomson passed away on 20th January 2007, never being a regular church attender, there was a humanist service held for him in the Crematorium at Inverness. Ron left the trials community of the Lochaber Club and the towns-people of Fort William with great memories of a true character of the sport of trials. 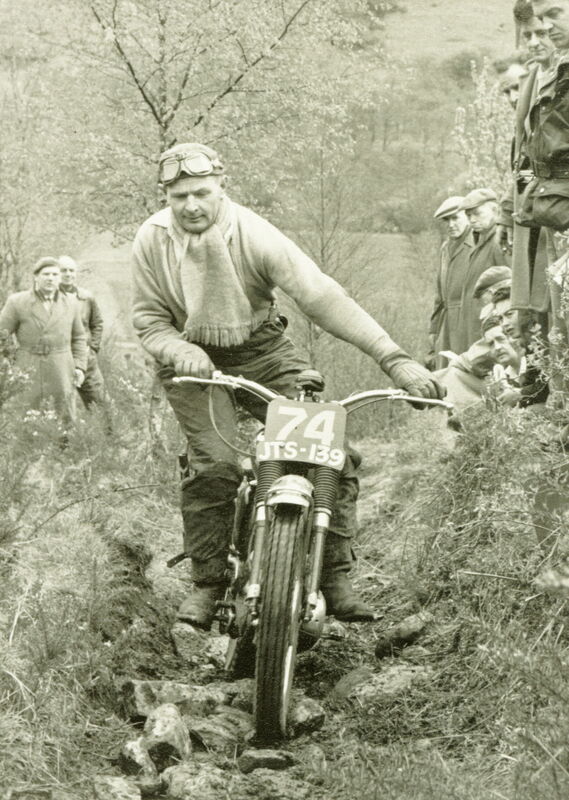 Ron Thomson in 1964 at Achintee Farm on his 499cc BSA Gold Star. Photo Courtesy Mrs Helen Thomson, Fort William. Trials Guru on Ron Thomson: Ron Thomson was a well liked individual who moved from his native St. Andrews to work at the British Aluminium works at Fort William. The reason was simple, so that he would live in God’s trials country! He set up business initially in a shed in his back garden fixing motorcycles and lawn-mowers for local people. His business grew and he obtained premises at the Industrial Estate at Caol a few miles from Fort William on the A830. Many of the younger riders in the town benefited from Ron’s knowledge, which included Hugh and Alister McDonald, Alastair Macgillivray. Gary MacLennan and Rodger Mount. Friends of Ron Thomson, Hugh McDonald Senior and Junior. Hugh Snr is on Ron Thomson’s BSA Gold Star and Hugh Jnr on the special bike built for him by Ron Thomson. Photo courtesy of Alister McDonald, Fort William. His business was called R.S. Thomson (Inverlochy) Ltd. He ran a repair shop and MOT test centre for motorcycles. He was agent for chain-saws and garden equipment and employed Cameron ‘Cammy’ Kennedy for many years. 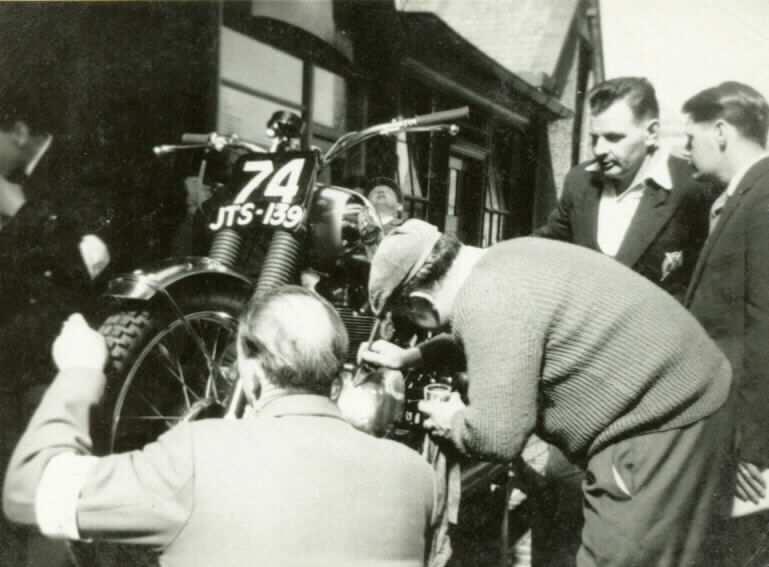 Ron gets his 250cc BSA C15T examined and security marked at Gorgie Market in May 1959. On Ron’s left is Davie Miller, one of the course markers of the SSDT. Photo courtesy of Mrs. Helen Thomson. It was quite usual to swing in past Ron’s workshop for a great natter about the old days. But as sure as guns you were never there long until another enthusiast also had the same idea! How Ron got any work done heaven knows. He was a good builder of wheels, which itself is a bit of a ‘black-art’. When Ron passed away after a short illness the business folded and Cammy took up employment with The Hire Centre in Fort William. Ron’s friends were not only Scots riders of his era like Jack Williamson; Arnott Moffat; Tommy Robertson; Johnny Clarkson and Bob Paterson, he also enjoyed the friendship of Gordon Blakeway; Ralph Venables; Peter Stirland and some of the best known riders of his era. They all knew Ron Thomson! This article was put together from notes John Moffat made during an interview he had with Ron at his workshops at Caol some years ago and personal recollections by Moffat himself of Ron Thomson pieced together over many years knowing Ron Thomson. Post Script: Added 01/02/2015: This story was spotted by Ron Thomson’s Grand-nephew, Ron Fisher who lives in Canada. It brought back happy memories of a visit to Scotland back in 1997 and indeed Trials Guru has been able to put Ron Fisher and Mrs. Helen Thomson in contact as a result of the article you see above. With special thanks to Mrs. Helen Thomson of Inverlochy, Fort William for the photographs which accompany this article. We have been contacted by former Scottish Speedway professional, John Wilson who now lives in Spain. John owned the ex-Ali McDonald Ariel MDB590 and he has kindly let us see photos of the restored machine. He sold it shortly before emigrating to Spain some years ago. The ex-Ali McDonald Ariel HT5 (MDB590) nestles inside John Wilson’s den. His speedway memorabilia is in the background. Photo: John Wilson. A proud John Wilson shows off his Ariel. Photo: Chris Wilson. Ron was a very close friend of my late father Hugh Mcdonald and uncle Alister Mcdonald as well as several other local riders namely Billy and Bobby MacLeod, Ian Pollock, Ally Cameron .Ron built myself and my brothers our first bike and we had great fun on it down at our house in Drimarbin. 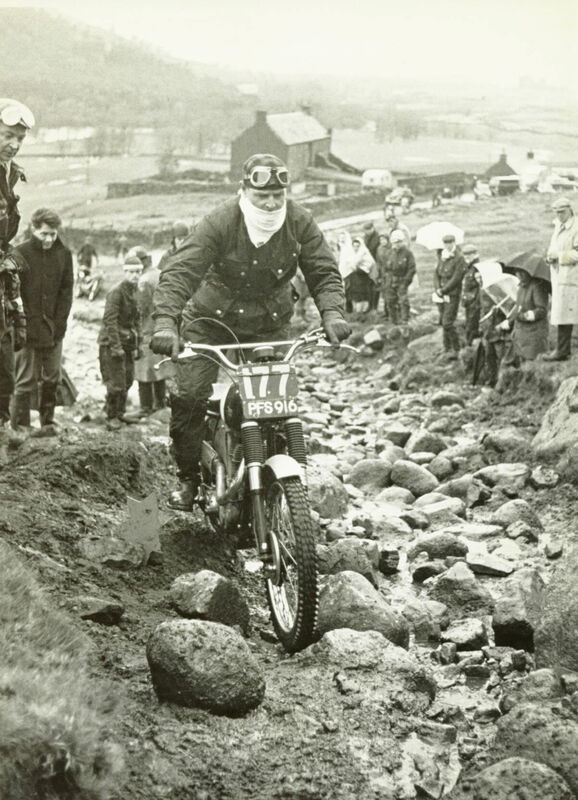 In my days at trials any problems i had with the bikes it was no problem for Ron to have a look at them . On many occasions i was down to his workshop in Inverlochy for Ron to do a few minor changes and was only to happy to help out. Hi John, what a great and true story about a great man who knew a lot about motor bikes and lawn mowers. Ron had a heart of gold and was a very special person to all our family. Cheers, Hugh McDonald now living in Australia. Hi. Ron is my Uncle and I just wanted to tell you that the tears of joy I’m experiencing right now are due to your incredible comments about him. He treated me to a tour of Scotland where I met family I didn’t know existed. His brother George Fisher was my grandpa. They were the spitting image of each other! Thank you gentlemen. It was a visit from the past.